Ecobrite is a hard, compact, slow burning, smokeless fuel for cookers, stoves and room heaters. Its clean regular sized ovoid’s provide long lasting constant, consistent, and controllable heat. Ecobrite will burn steadily (slumber) for long periods of time with sufficient air supply from your stove. Ecobrite is a fully approved HETAS manufactured solid fuel tested to their highest standards. Environmentally-Friendly – Lower CO² emissions. 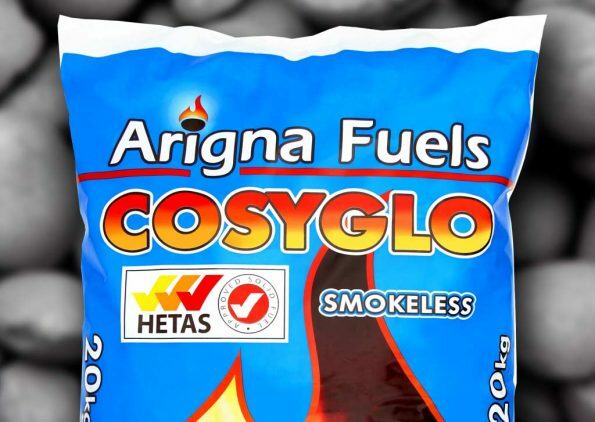 Specially designed for open fires, Cosyglo has been Ireland’s most popular Smokeless Fuel for over 20 years. And no wonder… it burns for hours, generating excellent heat and leaves behind very little ash.